Oct 26, 2017 (LBO) – Sri Lanka’s US 1.4 billion dollar Port City project Environmental Impact Assessment with 72 conditions will be soon open for public comment, a senior official said. “We hope to open this for public comment by next month – all the preliminary work on the EIA is now complete,” Nihal Ferando, project manager, Port City said. Ferando also said that under the previous agreement if traffic congestion in the capital impacted the Port City the Government would have had to pay compensation but under the new agreement this was not the case as they had a comprehensive plan in place. 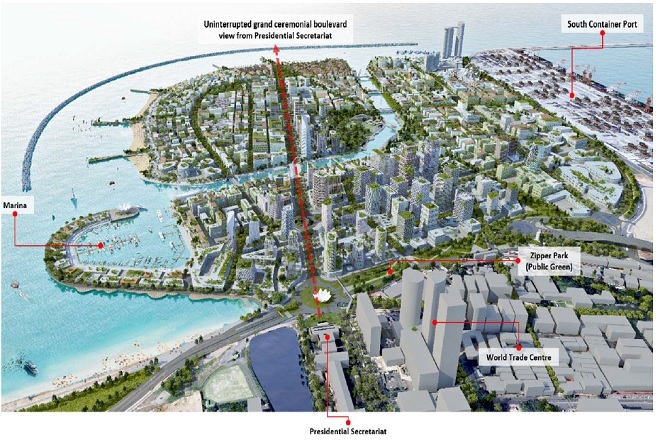 The new city will be linked to Colombo through an elevated highway planned from the Katunayake Expressway to the reclaimed area and then as a second access point it will be joined to Colpetty through an underground tunnel running through Galle Face. This connection will link commuters with an light rail system, which will have a hub station in Colpetty. Two light rail systems, including another one linking the main Colombo city to Malabe will kick off next year with funding from Japan International Cooperation Agency (JICA), he said.